Purcell Mountain Lodge is a helicopter access backcountry mountain-top lodge near Golden in British Columbia, Canada. This truly unique all-inclusive remote vacation destination is ideal for guests looking for an active vacation…or a quiet retreat. 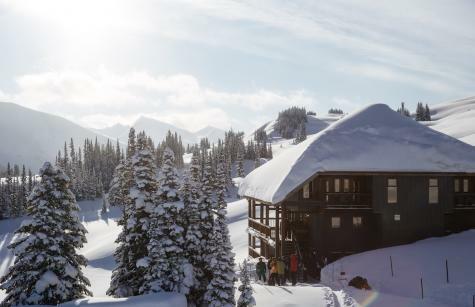 For more than 25 years, the lodge has operated as a fully functional hotel in the backcountry. Purcell Mountain Lodge welcomes visitors in the winter, summer and fall seasons and offers suitable activities for all fitness levels to enjoy. Over 3,000 acres of rolling alpine meadows, fields of wildflowers and countless peaks and ridges, set against a backdrop of tumbling glaciers and alpine vistas, beckon to hikers of all abilities, ski touring enthusiasts, telemark skiers and snowboarders. Accessible by a 15-minute scenic helicopter ride from Golden, B.C., Purcell Mountain Lodge is near Glacier National Park. From the airport in Calgary, Alberta, it is a three-hour drive to Golden with popular tourist destinations along the way, including Banff and Lake Louise. Enjoy a 4-night stay for two in the main lodge in a private room with one queen bed or one queen bed and a twin bunk, based on availability. All meals are included – hot breakfast, lunch, appetizers and a three-course plated dinner each night. A cash bar is available with a selection of specially selected wines, craft beer and other beverages. Fees for additional guests determined upon booking and based on availability. Relax and unwind with all the comforts of home in this three-story, timber-framed lodge. This cozy setting in the backcountry is complete with an open dining area, living room with fireplace, and a quiet library. A traditional wood-burning sauna is just steps away from the main lodge. Ten private guest rooms with stunning mountain views are located on the upper floor. Each room has its own sink and vanity; three private showers and three private bathrooms are across the hallway for lodge guests to share. In summer, activities include daily hikes trekking thru North America's largest alpine meadows. Summer is also the perfect time for photography and wildlife sightings. Winter activities include ski touring, snowshoeing and sledding. Hikes and snow activities are led by ACMG (Association of Certified Mountain Guide) guides. All activities are non-mechanized and self-propelled. The helicopter is for transport to and from the lodge. This is not heli-skiing. Ski, snowboard, snowshoe and safety gear must be rented prior to arrival at the lodge. The lodge is closed mid-September to mid-December and April to early June. Note: Your stay at Purcell Mountain Lodge will be from Monday - Friday. A one-night hotel stay on Sunday night near Golden, B.C., is included in this package. Helicopter flights depart for the lodge on Monday morning; return flights from the lodge to Golden on Friday morning.